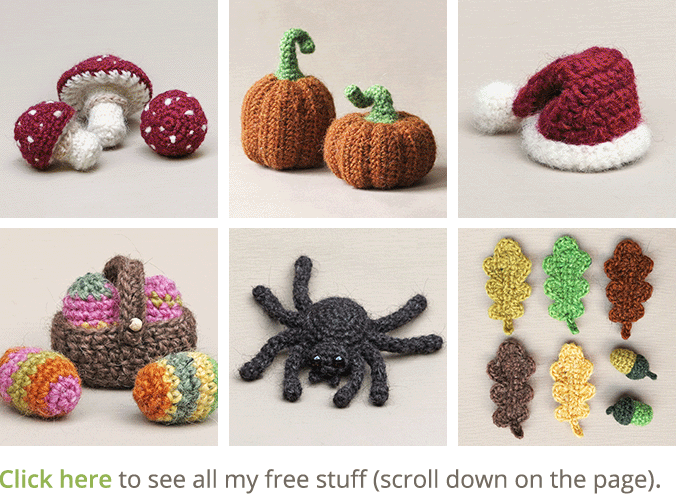 This is a little gift pattern, a Santa hat for all our Popkes. I was making a little Santa hat for Falun, so he can wear it when he’s posing for my Christmas card, when I realised this could be a fun pattern for all of you. 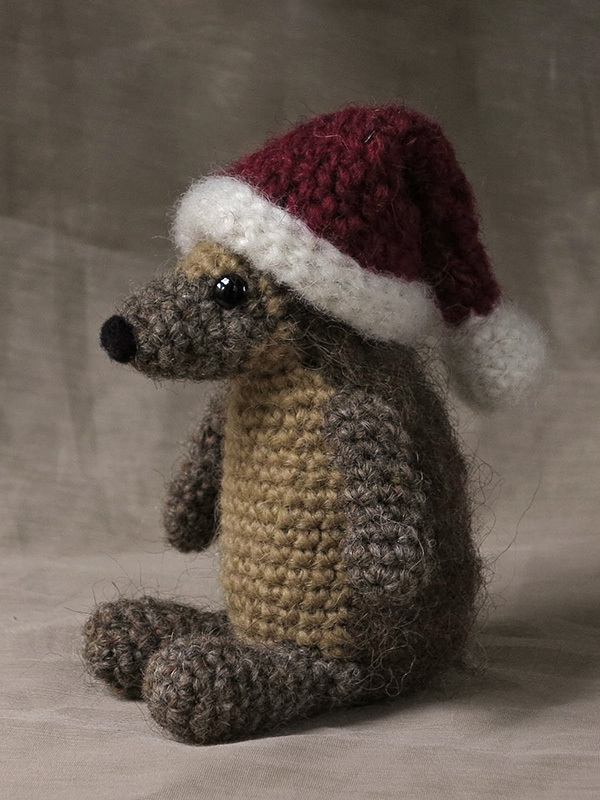 Flims agreed to model for this hat on this dark and cold day…. 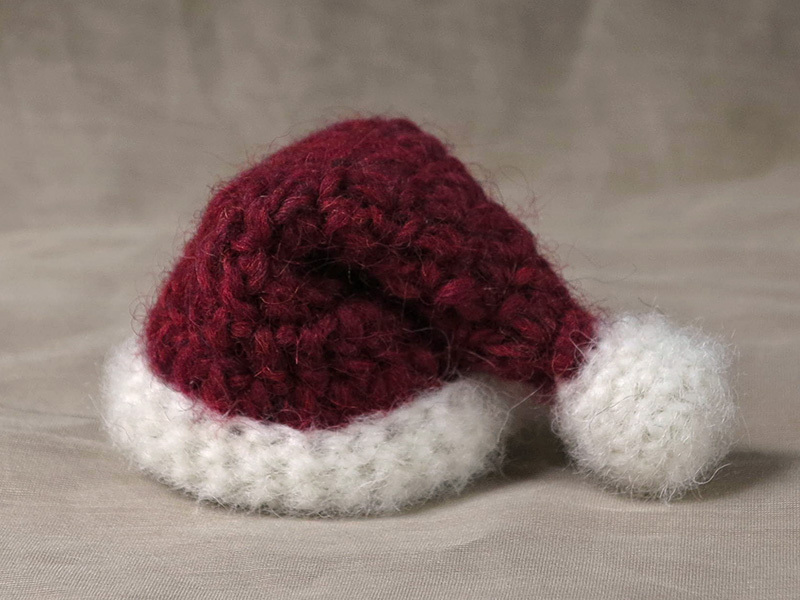 The Santa hat pattern is very simple and quick to crochet, you can make a bunch in a day if you like. Not all dolls are the same size, so this hat can be easily adjusted to fit every doll, by simply adding a few rounds (explained in the pattern). This hat does fit Flims, Falun, Danylion and Floro (however, Floro thinks it doesn’t look very good on him), if it’s made with the same yarn as they are. 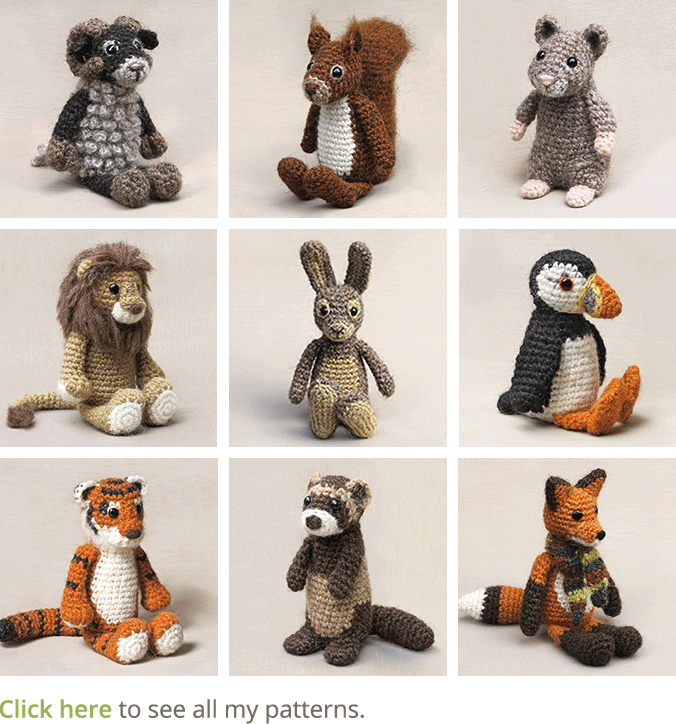 To make this pattern you need worsted weight yarn and hook E US/ 3,5 mm. 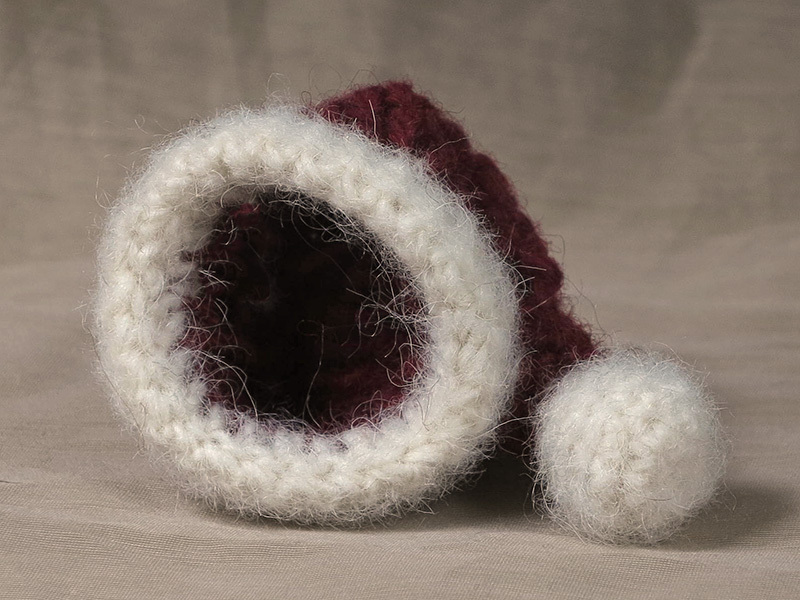 I’ve used Lett Lopi wool to make the hat, colours white 0051 and dark red 1409. You need sewing materials and a hard brush to get the fuzzy fluff ball and brim. 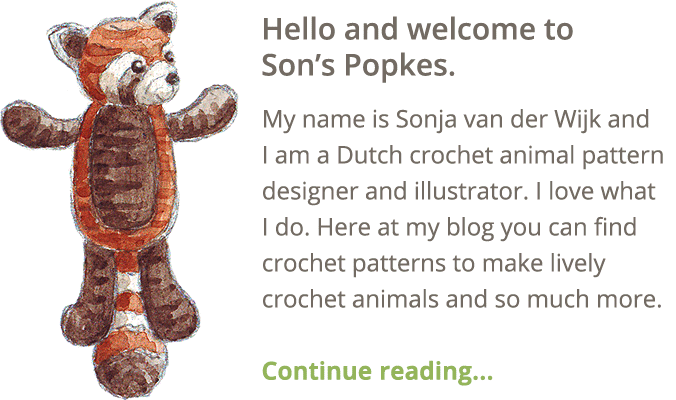 You also need crochet animals to put the hat on. The red part, work in rows. 2. sc in each around = 6, close with sl st.
4. ch 2, (dc in next 3, 2 dc in next) x 2 = 10, sl st.
5. ch 2, (dc in next 4, 2 dc in next) x 2 = 12, sl st.
6. ch 2, (dc in next 3, 2 dc in next) x 3 = 15, sl st.
7. ch 2, (dc in next 4, 2 dc in next) x 3 = 18, sl st.
8. ch 2, (dc in next 8, 2 dc in next) x 2 = 20, sl st.
9. ch 2, (dc in next 9, 2 dc in next) x 2 = 22, sl st.
10. ch 2, (dc in next 10, 2 dc in next) x 2 = 24, change colour to white in sl st. If you need a bigger mini hat, don’t change to white just yet and continue like above by adding two stitches each round, till your hat is the right size. Keep in mind there will be white folded rounds (three rounds of sc’s) below the red part of the hat. 11. ch 2, (dc in next 11, 2 dc in next) x 2 = 26, sl st.
12. ch 1, sc in each around = 26, sl st.
13. ch 1, sc in each around = 26, sl st.
14. ch 1, sc in each around = 26, close with sl st and leave a tail for sewing. Now fold the white rounds upwards, so your hat will have a nice and thicker brim. Make sure you don’t see red on the brim. Sew it tight with the tail you had left. 6. (sc in next 3, s2tog) x 2 = 8, sl st and leave tail. Attach the little ball to the hat by shoving the hat a bit in the gap of the ball. When it’s in the right place, carefully sew it tight and brush it. Also brush the brim of the hat. To get a real Santa hat effect for the white part, cut the too long hairs off so it’ll be hairy but not too much. 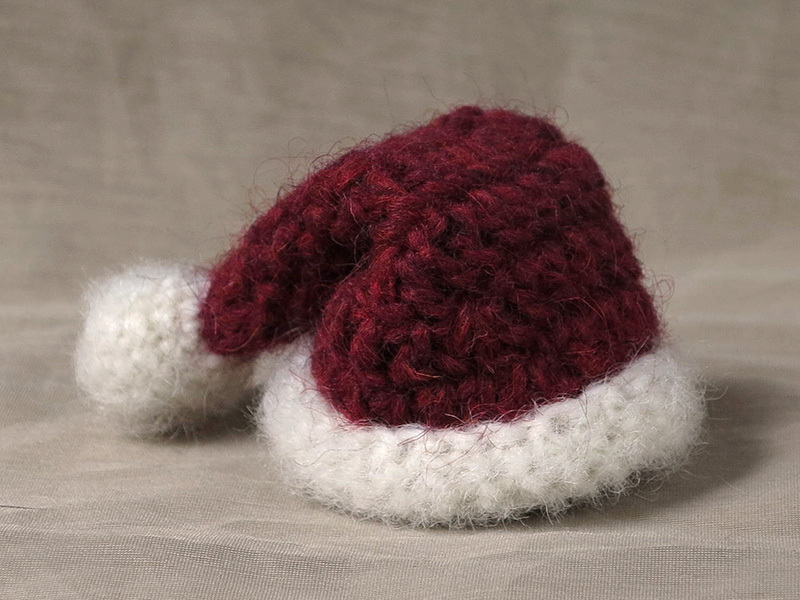 At the end of the proces, you can sew the hat together at a point to get it looked bend. I sewed it just above the white brim. Thadah! It’s finished. Here are some more pictures of this cute little hat. Note: It’s not permitted to put this hat on real animals, they don’t like it, it reduces their self confidence and they don’t think it’s very funny either. Sweet – going to make a few of these Thanks!